If you look very hard, and are careful not to blink, you can sometimes see the twinkling reflection of starlight on gossamer wings high in the velvet night sky. Gabby the Fairy is out on her Evening Flight. Dressed in a dainty blue gown, silvery wings fluttering behind her, and large blue eyes shining with happiness, Gabby travels on the Winds of Imagination and watches over all the Children of the Forest. A sweet lullaby can be heard as Gabby passes by. Everyone snuggles under their covers feeling safe and secure. In fact, Gabby knows many magical songs. She says that there is a song for every feeling, good or bad. Of course, the happy songs are Gabby's favorites! Once, Woody the Gnome traveled to the far side of the Forest to visit Dewey the Elf in his tiny thatched hut. As he walked along, Woody noticed the Sun's gentle warmth on his back, and the clear blue of the sky. The fresh scent of green plants and moist earth made him feel glad to be alive. Woody didn't know there was a song for his feeling until Gabby flew by. She saw his problem and taught him a wondrous magical melody. Now, whenever Woody feels sad or lonely, he sings his Happy Song and soon feels good again. Because of all the kind things she says and does, everyone likes to be around Gabby. No one has ever heard her say a cross word. All of the Children of the Forest love her because she brings out the best in them. 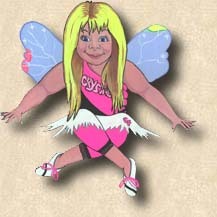 Gabby the Fairy spreads happiness just by being herself!